I have a S912 KM8P box with latest CE and hyperion.ng. I am observing a strange behaviour in that, if I correctly configure the rgb order in the configuration interface for videos they play just fine, but for the static elements like skin, menue, photos red lights and blue lights are switched. If I configure them correctly for the static elements they are switched during playback of video. Are there different grabbers involved ? Any chance to set a “dual” configuration that matches both ? Thank You ! Please try again with the upcomming CE release. Amazed by speed and quality of answer. Wow ! Tested it last night with ge2d grabber. Unfortunately the nightly build still shows the problem. I don’t have this issue with my S912 and Arduino, but I had it at the beggining and the cause was my misconfiguration. Static images via Kodi had the proper colors but the videos didn’t. Make sure that you have the same color order both in the Arduino sketch and the Hyperion configuration ie. for my APA102 it’s gbr. I also do not have any issue with my S912 and WS2801 LEDs. So It may be a wrong config. Just create a new config and try again. Indeed I have an Arduino too. Thank you for pointing me in this direction. I will do some more testing. In the meantime I have done a lot of investigation. The problem persists. I am pretty convinced it must have something to do with the framebuffer structure. It also happens the same way with “standard” hyperion. I can hardly believe this has something to do with an errneous configuration in the JSON file. Could someone please provide a working S912 configuration to do further investigation ? 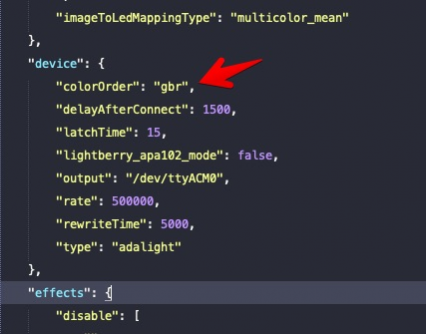 Did you verify your Arduino sketch RGB order besides only JSON? Thank you for the quick info. Exactly the the same configuration I was using is running without problems on my S905X box running the same CoreElec version (for 905 of course) attached to the same Arduino, connected to the same TV. Therefore I do not really want to believe in hardware problems. The only other difference than the CPU is the GPU, which is a T820 in the 912 box. Will do another test with the config you sent as a starting point. I got KIII Pro with S912 and T820 and all is fine. You might need to manipulate the LEDs color order like I had to in my case. Depends on the type of LEDs you’re using. Just do some trial and error. Sorry, no luck with all configuration tries. the framebuffer format is RGB32.